Singer Josh Groban took to Twitter Tuesday night after a 29-year-old man deliberately drove a truck through a crowded bike path in lower Manhattan, leaving eight people dead and nearly a dozen injured before being taken into custody. He was among the cyclists, pedestrians, and high school students who witnessed the deadly attack NYC Mayor Bill de Blasio called a "cowardly act of terror." Groban said that he wasn't far from the path of the attack along the West Side Highway bike path Tuesday afternoon. He'd been even closer to the site but was distracted by his dog, he said, who pulled him to a park half a block away just moments before. At 3:07 p.m., prior to the attack, Groban tweeted a photo of his dog. "Two things get me through my week," the "You Raise Me Up" singer tweeted. "My shrink, and meeting friends at the dog park." At 3:32 p.m., he tweeted again. "I hope everyone's ok. Was half a block from me, didn't see it but heard 8-10 quick rounds fired off. Be safe with your kids out there." The attacker was shot in the abdomen by police after jumping out of the truck wielding what turned out to be a pellet gun in one hand and a paintball gun in the other, and shouting what witnesses said was "Allahu Akbar," Arabic for "God is great," authorities said. The man underwent surgery and was in critical condition but was expected to survive. 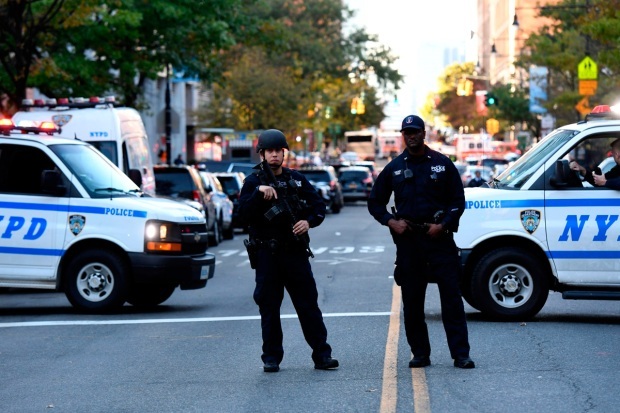 The suspect authorities have since identified as Sayfullo Saipov, 29, drove a Home Depot rental pickup truck at least 10 blocks down the West Side Highway bike path. He hit about a dozen pedestrians and bicyclists before crashing into a school bus near Stuyvesant High School and elementary school P.S. 89. At 3:39 p.m. Groban tweeted again in the aftermath of the attack. "I'm shaking," he tweeted. "That's the corner I was supposed to have my coffee but my dog pulled me into the park half a block away 10 min before shooting." He also shared a video he took and praised the response from the city's police and fire departments. "Once I got far enough away I took this video of the quick response from our amazing NYPD and NYFD," he tweeted at 3:43 p.m.
"Devastated for the victims and their families tonight & inspired by the spirit of this city," Groban tweeted later, at 5:39 p.m. "Sirens and trick or treaters everywhere." The attack "was intended to break our spirit," Mayor de Blasio tweeted. "But New Yorkers are resilient. We will be undeterred."